There are two serious problems with America’s Social Security system. Almost everyone knows about the first problem, which is that the system is bankrupt, with huge unfunded liabilities of about $30 trillion. The other crisis is that the system gives workers a lousy level of retirement income compared to the amount of taxes they pay during their working years. Younger workers are particularly disadvantaged, as are African-Americans because of lower life expectancy. These are critical issues, but perhaps looking at a couple of charts is the best way to illustrate why the Social Security system is inadequate. Let’s start by looking at some numbers from Australia, where workers set aside 9 percent of their income in personal retirement accounts. This system, which was made universal by the Labor Party beginning in the 1980s, has turned every Australian worker into a capitalist and generated private wealth of nearly 100 percent of GDP. Here’s a chart, based on data from the Australian Prudential Regulation Authority. Now let’s look at one of the key numbers generated by America’s tax-and-transfer entitlement system. Here’s a chart showing the projected annual cash-flow deficits for the Social Security system, based on the just-released Trustees’ Report. By the way, the chart shows inflation-adjusted 2012 dollars. The numbers would look far worse if I used the nominal numbers. The two charts aren’t analogous, of course, but that’s because there’s nothing to compare. 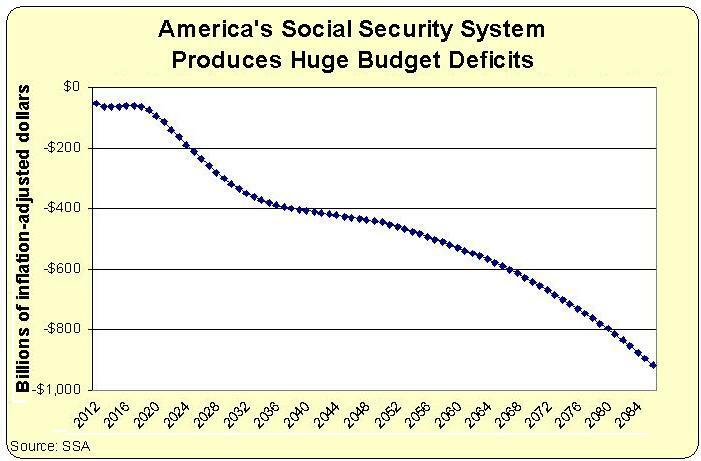 The Social Security system has no savings. Indeed, it discourages people from setting aside income. And Australia’s superannuation system doesn’t have anything akin to America’s unfunded liabilities. The closest thing to an analogy would be the safety net provision guaranteeing a basic pension to people with limited savings (presumably because of a spotty employment record). So now ask yourself whether Australia should copy America or America should copy Australia? Seems like a no-brainer. 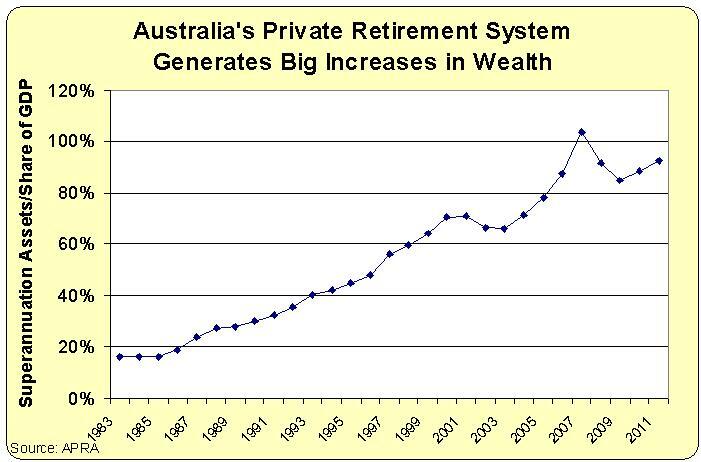 Australia has had pension schemes for public service workers and major private companies for many years. In 1980, the government a) made it compulsory for all workers, b) enforced a minimum contribution by all workers of 9%. Funds are invested and the worker eventually gets back the value of his investments at retirement. The retirement scheme is entirely separate from social security e.g unemployment, sickness, housing, family allowances etc. These are unfunded and paid out of central funds. We didn’t leave the SS money in the hands of bureaucrats and politicians to invest it. We just let them steal it. on August 18, 2012 at 11:57 am David L. Wood, M.D. My preference is to be able to choose between funds based upon their expense ratios, fully disclosed and the funds past performance. Then if the high fee guy with his guarantee can show me that his expense is more than offset by the performance, I can make an informed decision. As far as those so called ‘guaranteed returns”, there is a cost for that both in terms of fees and performance, and if the guaranteed return is below the market performance and it comes at a big expense ratio it will not suit my needs. Maybe it would suit yours, and as long as you are making an informed decision and the options available, then far be it to question your decision. However, currently, guaranteed returns have been pretty low, and if you had been in the market the last 3 years, you would have WAY out performed that guarantee. And maybe that was still a good decision for you, but it comes at a cost, so you just need to recognize that, in my opinion. The problem in the past for Australia, was that you did not have that option in their Supra. Maybe that has changed now, but last time I looked no one had the low expense ratios like a Vanguard who charges as little as 20 basis points for index funds. (even less for their admiralty accounts) If you are paying more than than, in my opinion, you better be really beating the market to justify the cost. Of course, in social security, you have a ‘guaranteed return’ in the way of a lifetime of payments after eligibility, but no choice to improve on the performance, and I take your point about leaving it to the bureaucrat is less than desirable. If I only had the choice between the bureaucrat and your guarranteed return, I too would probably chose what you have, but if I also had a choice of low cost VG index funds, then I would probably be more inclined to go that route, depending on age and closeness to retirement. @JustMe – But, is that really a problem? I live in Brazoria County, Texas – one of the three counties in the US (along with Galveston and Matagorda) that was able to opt out of Social Security in the early 1980’s so I’ve seen a lot of private plans up close – though unfortunately not able to participate in ours (it’s restricted to just county employees). I can’t speak on how Australia does it, but the way it works here is that different wealth management firms bid every few years for control of the fund. They use it to make investments since they can make a larger return for a larger stake – just like other hedge funds.They have to guarantee a certain return on the money and pay out of pocket if they lose money, but if they make a return higher than the guaranteed return – they get a percentage of that return as their fee/profit. So they only make money if the account makes money higher than the guaranteed return – and they only get a fraction of that.The rest goes to the account. So they aren’t “draining off any wealth” – every account grows by a guaranteed return every year. The wealth management firms only make “big fees” if they make even bigger returns on the account. That’s a good thing. The profit incentive makes them very concerned about making the proper investments in high growth markets and since they have to make up any losses, they limit their high risk moves. Politicians and bureaucrats have a much worse investment record. So, it boils down to this – would you prefer leaving the management of your fund to a lesser able, uncompensated bureaucrat who makes the same amount regardless of whether or not the fund makes or loses money or would you prefer leaving the money in the hands of highly skilled investment managers who guarantee your investment and who don’t make a dime unless they make you money above and beyond your guaranteed return? For me, that’s a no brainer. One of these days the liberal democrats will stop bragging about being the party that started Social Security!!! Totally agree with “Just Me” ! Just me has a good point, but politicians cannot watch money move from point A to point B without taking off a hunk as it goes by. Apologies to Tom Wolfe. The only thing wrong with the Australian Superannuation program, as I see it, is the Big fees that are charged by the companies administering the plans. It drains off the accumulated wealth over time. If Auzzies could have a plan administered by no load or low load fees, like Vanguard, at 20 basis points, it would be much better. The arguments for privatized retirement accounts are so compelling, from Australia and elsewhere, that only fools can oppose them. And by “fools” I mean Democrats and other Statists who demand control of other people’s money. The word cliché exists for a reason. The path to hell is paved with good intentions. They wanted to take care of the elderly, they thought they had a good scheme, but then politicians said, “Oh look a giant pool of money we can play with”. It’s all over, but for the crying and dying. There are other ways to solve our problems. A good blog that demonstrates this point.